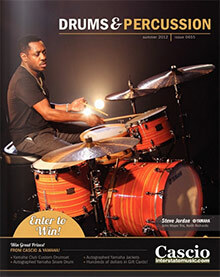 Cascio Interstate Drums & Percussion catalog has everything the professional or student percussionist needs with great coupon code specials that go easy on your budget. Your savings will be applied automatically at checkout on the Cascio Interstate Drums & Percussion website. Drum sets -- Beginners and pros alike will find the best names in shell sets including Mapex, Yamaha, Pearl, and Ludwig drum sets. Choose from 3, 4 5, or 6 drum sets, plus stands, heads, hardware and expansion packs. World music -- Add a world music sound to your band or solo gigs with Thai, Japanese, Celtic, Middle Eastern, Caribbean and African musical instruments. From djembes and bodhrans to steel drums and dumbeks, they have the percussion instruments and drums to bring an international beat to your band, including the most popular styles of African drums. Electronic drums -- Get the traditional or high-tech percussion sound you want with electronic drum sets from Yamaha, Roland, Hart and other leaders in electronic percussion. Student snare drum kits -- Start new drummers out the right way with a complete snare drum kit, including the drum, stand, practice pad and sticks. Or choose a deluxe snare drum kit with mallets, music stand and travel case for easy transportation to lessons and practice. Drum sheet music and instructions -- Learn to play or to simply become better with videos and guides to ethnic, handheld, drum set and snare drum music techniques and notation. Then choose the drum sheet music you've been looking for from their easy-to-search collection of popular bands and shows. Whether you're a beginner looking for your very first drum set, a pro who needs some new Zildjan cymbals for an upcoming gig, or a world music percussionist looking for the best in African drums and other international percussion, Cascio Interstate has the drum sets, accessories, music and hardware you need.